What is the impact of nitrogen in legume biomass on soil nitrogen? We’ve seen that leguminous, green manure cover crops can accumulate impressive amounts of nitrogen in their above-ground biomass. With all of that plant material left on the soil surface, does at least some of that nitrogen work its way into the soil? A soil nitrate analysis is a “snapshot” of the soil status, since nitrate is quite mobile in the soil. 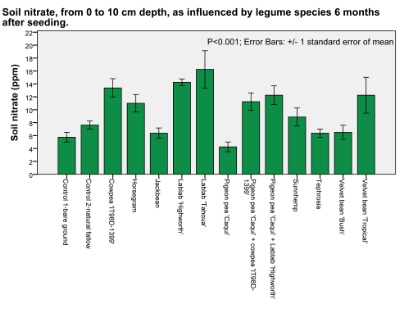 That said, in soil sampled at a 0-10 cm depth, we saw significant treatment differences 6 months after legumes were seeded. Soil nitrate increased from 6 ppm on bare ground to 14-16 ppm with lablab bean (see the graph below). Cowpea and velvet bean also increased soil nitrate in comparison to bare ground. Note that soil nitrate was also higher with these legumes than with natural fallow. In a zai pit study, 5 months after seeding sorghum, we saw that the concentration of nitrogen in sorghum plants was greater with cow manure + legume than with just cow manure alone. In that study, the legume plants were grown in zai pits 75 cm away from the pits in which sorghum was planted. Nitrogen concentration in crop plant tissue is a strong indicator of the effectiveness of fertility inputs. Taken together, the results show that legume crop residue left on the soil surface does indeed have a positive impact on soil nitrogen. We were also encouraged that soil phosphorus did not decline with most legumes in comparison to natural fallow.